which impart taste and flavor to wine. It is also called goût de terroir in French. ORIGIN French, land, from medieval Latin terratorium. Envirnomental necesities for growing premimum Pinot Noir Grapes. Elevation - Elevation is critical for maximizing the entire growing season. Generally, bud break occurs 1-2 weeks prior to lower elevation vineyards. Elevation at Alberti Vineyard: 940 feet. The elevation is also critical with regard to the cooling effect of the Monterey Bay. Summertime in the Monterey Bay brings fog to the lower elevations. This cools the evenings down, a trait that Pinot loves, but can cause problems with mold pressures that will ultimately affect the fruit. The typical morning starts out cool and slowly warms as the movement of the AM air flow caused by the fog at the lower elevations "pulls back". 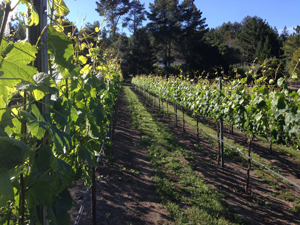 Southern Exposure - With the vineyard positoned in a North/South row arrangement, each row is allowed to maximize the solar radiation for maximum photosynthetic production. The hanging grapes experience the open morning air circulation and direct sun exposure. This exposure is accomplished by thinning shoots and leaf pulling on the Eastern side of the rows. The leaves on the Western side of the rows are mostly left on to protect the grape skins from the harsh afternoon sun. Sun damage can cause a whole series of problems which affect the skins and alter the final wine product. Slope - The slope of the vineyard is quite critical. If the vineyard is flat, the air stagnates causing either cold or hot spots to occur. A gentle slope in the vineyard is necessary for air flow. As you know, cool air sinks and hot air rises. Alberti Vineyard has a gentle slope that allows air to move within the vineyard to minimize frost early in spring when buds and tender shoot tissues are vulnerable. The slope also allows the heat of the mid-summer day to rise, causing a cooling air-flow within the vineyard. Soil - The topsoils are well draining and range from one inch to three feet of sand, sandy loam, loam, and clay loam on top of weathered or lithic bedrock. The vineyard is surrounded by lower elevation chaparral which includes madrones, Redwoods, manzanita, oaks and chamise(greasewood). After winter dormancy, the vines are ready for spring bud break and the resulting growth of shoots and flowers. After flowering and fruit set, the berries develop green until veraison. Veraison is a milestone for grapes and is a signal to birds that the fruit is maturing and is ready to eat. It is also the time to net the vines to protect the fruit from the birds and allow the vines to continue to develop all the complexities of the skins, fruit juice and seeds, which lead to the complex polymers we enjoy in the finished wine. The growing season ends with healthy ripened fruit...when there is a balance between the sugar content, pH and total fruit acids. When all these factors come together, it is time to pick.